Absolutely stunning! Must be seen! Beautifully renovated, this immaculate raised bungalow showcases gleaming new maple hardwood flooring throughout, a gorgeous new kitchen with sleek white cabinets, new bathroom, many other attractive updates — plus boasts a fantastic Current River location that is close to Boulevard Lake, schools and parks! With all its many quality updates, this home shows like it is new! New paint and trim are throughout, along with new light fixtures, new doors, the windows have also been updated. Also new is the furnace and the roof was updated in 2010. 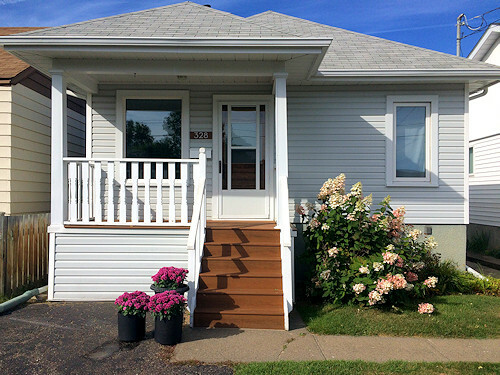 Two bedrooms are on the main floor with a third bedroom in the basement, which has large windows thanks to this home's raised-bungalow style. The living room has a large picture window along with built-in shelves and cabinets. Relax and enjoy a favourite beverage on the covered veranda out front or on the patio in the fully fenced and private back yard. Call or text 807-633-2173 today to arrange a personal showing of this irresistible beauty!